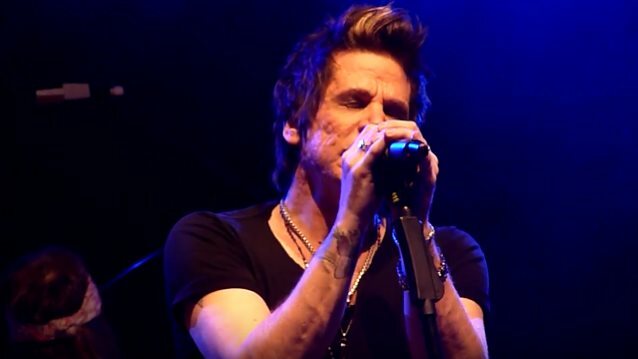 Norwegian rockers TNT have once again parted ways with their American vocalist Tony Harnell. At the time of Harnell's latest exit from TNT, the band was said to be working on a new studio album for a 2018 release via Frontiers Music Srl. TNT announced the most recent split with Harnell in a press release on Wednesday (October 11). The band wrote: "After a thirty-five-year career... with a few scattered breaks and temporary lineup changes in that time, it is with a heavy heart that the remaining original members of Norwegian rockers TNT have made the decision to move on in separate musical directions. Being together for so long... even though separated by an ocean, they became brothers. Ronni [Le Tekrø, guitar], Tony and Diesel [Dahl, drums] wish nothing but the best for each other and will always be there for each other... although not musically. "TNT will continue with a new vocalist and new release through Frontiers Records, to be announced very soon. The band will then commence international touring in early 2018 in support of the new release. "Tony will immediately start work on a new STARBREAKER album, its third, also through Frontiers Records. A solo release is also in the works. Tony will start touring worldwide early in the New Year, with STARBREAKER shows planned after a solo tour. "You will all be hearing great music from them again very soon!" Harnell — who spent eight months fronting SKID ROW in 2015 — spoke to Radio Trondheim this past January about what keeps him coming back to TNT after all these years. "It's really funny, because I think that what people think about that is not really correct," he said. "So, I think it's really just a matter of there's always been a time where it seemed like a good idea to take a break at times, and I think it's been ultimately good for the band, really, to take breaks and then come back together again. Like right now — we're selling out all the shows. What if we didn't take a break for the past couple of years and we kept going, would this be happening or would people lose interest?" According to Harnell, interpersonal conflicts within TNT "get blown out of proportion." He explained: "There's really not any major problem between any of us. It's just a matter of, we work for a while, and then we say, 'Ah, this isn't really the way we want it to be, exactly, so then we kind of go our separate ways and we come back together. But we always come back together for the music, because we have all these songs we worked on together. Ronni and I wrote all these songs over the last thirty-five years or something, and Diesel was a part of the original lineup and he's been there from the very beginning and actually was one of the people that created the band. And [original TNT frontman] Dag Ingebrigtsen, of course." The singer went on to say that he was once again deriving enjoyment from performing with TNT, something that hadn't always been the case. "I think that's part of it. I think when I'm not having fun anymore, that's the break time," he said. "And when I come back, I think, 'Oh, do I wanna do this again?' But as soon as I get in front of the people and I see how much they love the songs, it makes me like the songs again. If I just listen to them when I'm learning them again for the tour, which I don't prepare very well… but when I do listen through the songs, I think… there's, again, a love-hate thing of going, 'Oh, gosh! I have to sing these again.' But when I get in front of the people, I learn to love the songs again, because I see how happy they get. [That's when I realize] these are actually pretty good songs." British singer Tony Mills appeared on three studio albums from TNT: 2007's "The New Territory", 2008's"Atlantis" and 2010's "A Farewell To Arms".